There’s a new pattern in the Crochet Spot Store! 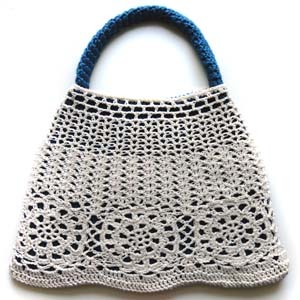 This purse pattern is crocheted using 2 layers. The outside layer is a lacy pattern that is made with join-as-you-go motifs and simple shell and v-stitch patterns. The inside layer is solid and crocheted with a contrasting color. The pattern uses multiple techniques to limit the amount of sewing required. Sewing the handle onto the bag is the only sewing required! The handle can be adjusted to be as long or short as desired. This entry was posted on Sunday, May 20th, 2012 at 10:33 PM by Rachel Choi	and is filed under Best Crochet Patterns. You can follow any responses to this entry through the RSS 2.0 feed. You can skip to the end and leave a response. Pinging is currently not allowed. I am just now finishing up a bag from the Ravelry site that is very similar. I am using Noro Silk Garden, so each ‘flower’ is a different color. I think the Noro yarns would be fabulous on this bag!